I'd heard great things about One for the Murphys and even ordered multiple copies for the sixth grade next year before reading it. I'm so glad I did because I know I will be recommending this book like crazy. Lynda Mullaly Hunt's debut novel has so much heart and is difficult to put down; I read it all in one day. "Sometimes you don't know what you want because you don't know it exists." Carley Connors has had a rough life, although she didn't realize it until a violent interaction with her stepfather lands her in foster care with the Murphys. This family, with their three sweet sons, firefighter father, and ideal mother, shows Carley what she's been missing and how her life could be. 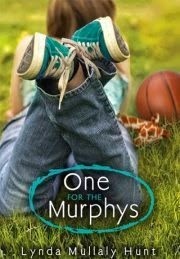 I loved how real the characters were in One for the Murphys. Mr. Murphy's Red Sox obsession mirrored my family's, and Toni's adoration of Wicked felt very true to her age. Most of all, Carley's emotions throughout the process of being placed in foster care were authentic. I wanted to give her a hug and thank Mrs. Murphy for taking care of Carley so well, finally. The book is a tearjerker and I have to say, I hated the ending. I was concerned by the lack of interaction of Carley's social worker, who seemed to think that good intentions were sufficient for raising a child. I also got a pit in my stomach when Carley's mother promises that "everything will be like it was before." If a child is sent to foster care, then the goal is not to have things be the way they were before. I worry for Carley, but am glad that she had her time with the Murphys. I hope those few months will be enough to keep her strong for the years ahead.